Armed with an amulet that channels the ultimate power of Faerie, Kellen searches for his love. However, control of the amulet’s energy comes with a price, and Kellen soon learns that Cali’s captor has plans for the stone. With the threat of the Star Catcher’s evil looming above Kellen and his kingdom, he’ll have to free the Heart of Faerie and break the curse the binds the Children of Danu to the darkness. But before that, he has to find his real father, the king. No pressure, right? Kellen and Cali will battle bewitched armies and unknown foes as they fight to stay together. Will Kellen embrace his immortal destiny? Or will his world, and the man he is fated to become, be destroyed by The Star Catcher? Interested to learn more about The Star Catcher? Check out the cool trailer from the award-winning, Kristen Kress of BrainFry Productions! Star Catcher Book Trailer from Brain Fry Productions on Vimeo. So the next song on my playlist isn't a new one, and Calienta certainly isn't an addict, but for some reason, The A Team by Ed Sheeran seemed to fit the opening scene. In it, Kellen has just received a note that Cali is missing and he and Gabe are planning their next move. They have no idea where Cali is other than they received a note stating: Cali has been taken. Only Rowan will know what to do. But my mind was already back to Cali. I had to get to her and entering the portal was out. Gabe sighed, as though he could read my thoughts. “So what did the paper say again?” The moment Cali had gone missing a lone strip of paper had floated from the sky with a message. It read: Kellen, She has been taken. Only Rowan will know what to do. I handed the message over. He angled his neck in order to scan the printed words with one large eye. “Rowan’s Cali’s sister?” “Yeah. She lives in Connecticut somewhere.” “It’s strange Cali never talks about her.” “Rowan’s mortal. When you’re immortal like Calienta’s family, time passes differently. You lose track.” A shudder ran through me again. Would Cali’s family even realize it if she died? Or would they be as out of touch with her life as they appeared to be with Rowan’s? So for this giveaway, we're releasing several cool items. Let me tell you about them! 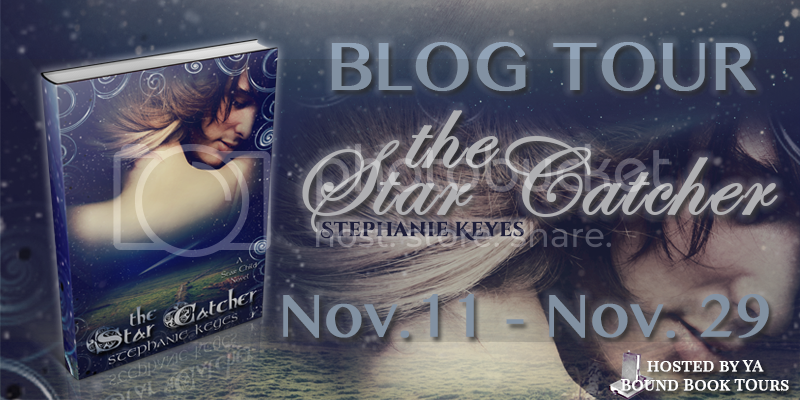 The Star Catcher tour is running through November 29th, so check out some of the great sites that'll be participating! [caption id="attachment_3185" align="alignright" width="200"] Stephanie Keyes, author of The Star Child series[/caption] Stephanie Keyes has been addicted to Fantasy since she discovered T.H. White as a child and started drumming up incredible journeys in her head. Today, she's still doing the same thing, except now she gets to share those ideas with readers! When she's not writing, Stephanie is also a graphic designer, international speaker, teacher, musician, avid reader, and Mom to two little boys who constantly keep her on her toes. In addition, she's best friend to her incredible husband of eleven years. Mrs. Keyes holds an undergraduate degree in Business and Management Information Systems from Robert Morris University and a M.Ed. from Duquesne University. She is a member of the Society For Children's Book Writers and Illustrators (SCBWI), as well as a featured author in the global group of writers, Love a Happy Ending.com. Keyes is the author of the YA Fantasy series, The Star Child, which currently includes The Star Child, After Faerie, The Fallen Stars, and the soon to-be-released finale, The Star Catcher (November 2013), all from by Inkspell Publishing. Mrs. Keyes is hard at work on a new YA Paranormal Romance.